Parks, a photographer, filmmaker, writer, composer, and civil rights activist, once stated that “I picked up a camera because it was my choice of weapon against what I hated most about the universe: racism, intolerance, poverty.” In 1948 Parks broke through the color barrier at Life magazine when he was appointed the first African American staff photographer. His initial assignment was to cover youth gangs in Harlem. Parks created a multilayered study of a teen gang leader, Red Jackson, pushing his story beyond traditional stereotypes and injecting an insider’s perspective on race into the mainstream media. Silhouetted against the broken window, Jackson appears both vulnerable and determined. The surrealist artist Max Ernst considered this the definitive portrait of himself. Befitting the surrealists’ love of the happy accident, it came together by chance while Sommer was tidying up in his studio and found two negatives—a portrait of Ernst standing against the side of his house and a picture of a waterstained concrete wall. When he printed the two together, Ernst’s skin took on the texture of the wall, suggesting the look of frottage, a technique of rubbing graphite on paper laid over a textured surface that Ernst pioneered in the 1920s. In the late 1940s and early 1950s, Frank made several handbound volumes of photographs, exploring different ways to link his pictures through non-narrative sequences. While in Zurich in October 1952, he assembled pictures taken in Europe, South America, and the United States in a book called Black White and Things. With a brief introductory quote from Antoine de Saint-Exupéry—"it is only with the heart that one can see rightly; what is essential is invisible to the eye"—the photographs are arranged in a sophisticated sequence that uses formal repetition, conceptual contrasts, and, as here, witty juxtapositions to evoke a range of ideas. Trained as a commercial photographer in Switzerland, Frank immigrated to America in 1947, taking a job with Harper’s Bazaar. He quickly tired of this work, and spent seven years restlessly traveling abroad, seeking subjects in each place that expressed his response to the people and their culture. In 1955 and 1956 he drove more than ten thousand miles around the United States to create his landmark book, The Americans (1958/1959). In this work, Frank looks beneath the surface of American life to reveal a profound sense of alienation, angst, and loneliness, as well as a people plagued by racism and ill-served by their politicians. See the corresponding contact sheet in the following slide. This contact sheet reveals the remarkable transformation in Frank's style in only a few years. An earlier London sheet, made when he was eager to sell his pictures to magazines, shows how he repeatedly photographed a hearse to ensure that he had captured his desired picture. The present New Orleans sheet, made when he had received a prestigious Guggenheim grant, reveals a more immediate and decisive response to the world around him. Soon after Callahan began to photograph in the late 1930s, he met the landscape photographer Ansel Adams, who inspired him to make clear, sharp, and highly detailed photographs. He was also deeply influenced by the Hungarian modernist Laszló Moholy-Nagy, whose work Callahan saw in the early 1940s and who later hired Callahan to teach at his school in Chicago. He encouraged Callahan to experiment freely, prompting him to explore the effects of multiple exposure, camera movement, and extreme contrast. Using these precepts, Callahan spent his life photographing nature, the city, and his family, distilling the mundane, transitory scenes before his camera into timelessly elegant pictures. Heir to the tradition of documentary photography established by Eugène Atget, Walker Evans, and Robert Frank (slides 4–6), Friedlander focuses on the American social landscape in photographs that can seem absurd, comical, and even bleak. In dense, complex compositions, he frequently depicts surprising juxtapositions that make the viewer look twice. He has made numerous self-portraits, yet he appears in these pictures in oblique and unexpected ways, for example reflected in a mirror or window. The startling intrusion of Friedlander’s shadow onto the back of a pedestrian’s coat, at once threatening and humorous, slyly exposes the predatory nature of street photography. Winogrand, a New Yorker who roamed across the United States during the postwar decades, left behind a sweeping portrait of American life. Making the middle class the primary subject of his pictures, he scrutinized both cities and suburbs, always on the lookout for those instants when happenstance and optics might join to make a good picture. 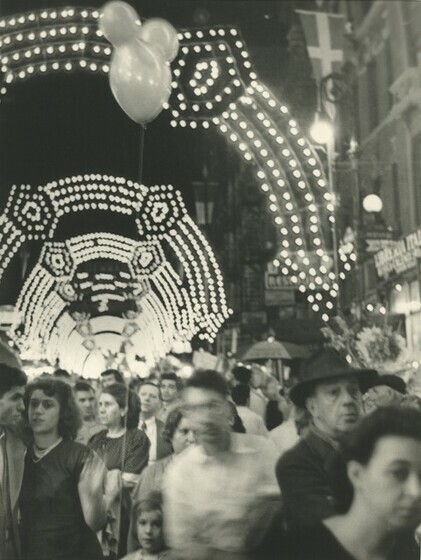 Winogrand once said, “when things move, I get interested,” perhaps explaining his proclivity for loose, casual, and occasionally off-kilter compositions. Despite this picture’s suggestive detail—a bandaged nose, sullen expressions—like many of Winogrand’s photographs it poses more questions than it answers. From 1967 through the early 1970s, Baltz made a series of photographs of the sides of warehouse sheds, stucco walls, empty billboards, and other geometric forms found in the postwar suburban landscape. These seemingly dispassionate compositions, rigidly flat and planar, relate to the minimalist art of the period. Yet while his subjects might not possess an inherent aesthetic allure, his photographs manage to wrest an exacting beauty from simple geometry and tonal qualities. 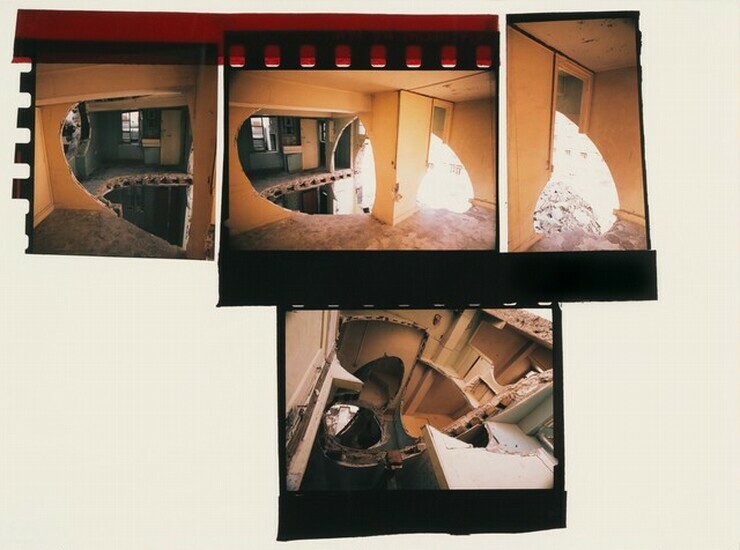 Known for his site-specific projects, Matta-Clark created temporary art works by sawing and cutting portions of walls and floors out of abandoned buildings, and then photographing his results. Fascinated by the process of decay and destruction, he made Conical Intersect by cutting large cone-shaped holes through two seventeenth-century houses in Paris that were slated to be demolished to make room for the Centre Georges Pompidou. One of the pioneers of color photography in the late 1960s, Eggleston has created an eclectic, if eccentric, portrait of his native Memphis and the South. Before him, color photography was thought to be the province of advertising agencies, fashion magazines, and amateurs making family snapshots, not “serious” photography. Eggleston’s deceptively simple compositions harness the descriptive power of color and frequently use unusual perspectives to summon the beauty of mundane subjects. His highly influential work has inspired many more to explore the potential of color photography.